Las Vegas: A Preservation Theory Mecca? Most people probably don’t think of Las Vegas, Nevada as a historic preservation hotspot. However, I recently attended the National Council on Public History’s (NCPH) annual meeting in Las Vegas and found several opportunities to engage with important questions facing the entire preservation community. We had many great discussions about preservation and architecture at NCPH, but one opportunity that stands out is a tour of the Neon Museum. The museum was founded in 1996, and their initial collection was the “Neon Boneyard” that belonged to the Young Electric Sign Company, more commonly known as YESCO. Today, visitors have the opportunity to take hour-long guided tours of the outdoor collection. 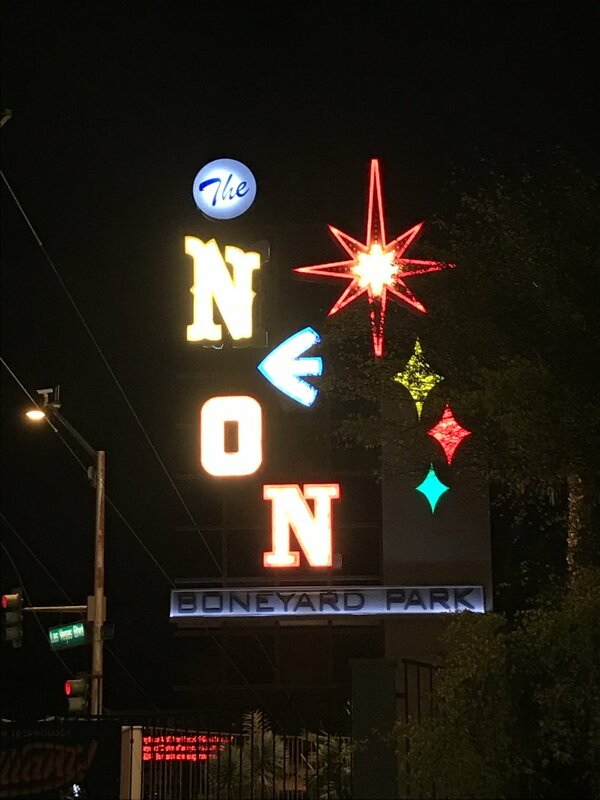 The Neon Boneyard originally belonged to YESCO and it became the initial collection of the Neon Museum when the organization was founded in 1996. Today, the museum collects not just neon, but any sign from Las Vegas. Image by Kim Campbell. My group was lucky, in Las Vegas no less, to have Tracey Sprague, the Collections Assistant, lead our tour, so we talked a lot about preserving these signs. Although the Neon Museum does have an offsite indoor storage space, ninety-five percent of the collection is exposed to the elements of southern Nevada in the Boneyard. We asked Tracey how she felt about this fact, and she told us about the constant internal battle between keeping the signs visible to the public in the Boneyard and better preserving them in the private storage space. Since almost all historic buildings are exposed to the elements, we face similar issues of maintenance in historic preservation, though typically without the option of moving them to a more protected space. Although many casinos and hotels in Las Vegas are demolished to make way for totally new businesses, others have gone through several facelifts or “re-brandings.” The Golden Nugget is one of those casinos and is still open in the “Glitter Glutch” section of Las Vegas Today. Images by Kim Campbell. Only a few of the neon signs in the Neon Boneyard now light up. When asked why this is the case, Tracey explained that the process of “restoring” a historic neon sign actually involves gutting the original electrical system and replacing it with a modern system to ensure it is safe. When rehabilitating historic buildings, we constantly face this same decision. Should we gut the building and essentially make it modern inside? How little can we remove while meeting minimum life safety requirements? This battle is ever present in the field, and while the Neon Museum has the option to strictly preserve some signs in their non-functioning state, preservationists are typically faced with the option to either allow a building to be demolished or make it functional for modern life. Whether or not signs are rehabilitated to function is decided on a case-by-case basis. 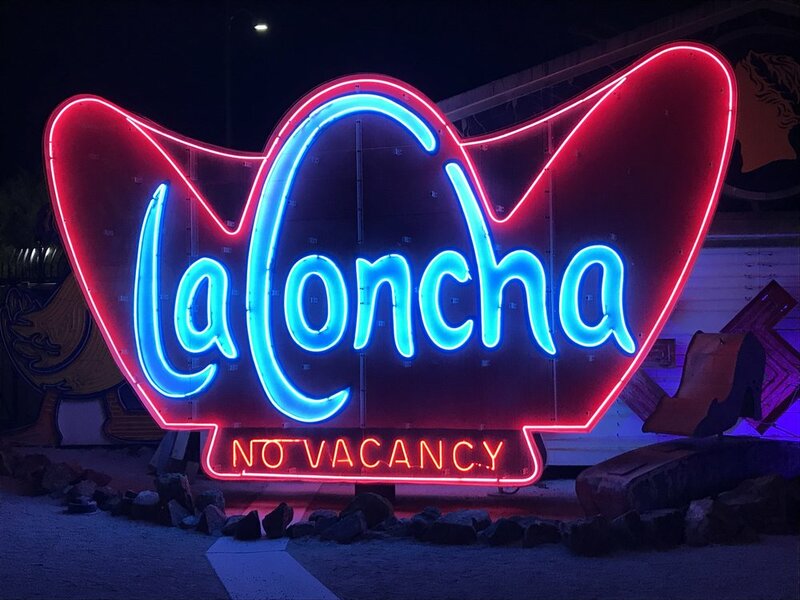 La Concha’s sign was relit for interpretive purposes, since the visitor’s center is now housed in the moved original structure. Image by Kim Campbell. The Neon Museum presented one final key preservation issue: that of a moved building. The visitor’s center and gift shop is an incredible example of a mid-century modern structure in the Googie style. Paul Revere Williams, the architect of the building, was the first African-American architect allowed in the American Institute of Architects. (To learn more about Paul Revere Williams, check out this great episode of 99% Invisible recommended to me by my coworker Lauren Mauldin.) This building was originally La Concha Motel on the Las Vegas Strip. When it closed in 2004, it was threatened with demolition because real estate on the Strip is so valuable. To save the structure, it was moved to the Neon Boneyard site. While preservationists are all for saving buildings, many in the field disapprove of moving structures, arguing they are not the same “place” once their setting changes. Wherever you fall on this spectrum, I think we can all agree that La Concha’s new home next to the Neon Boneyard was a major preservation win for Las Vegas.